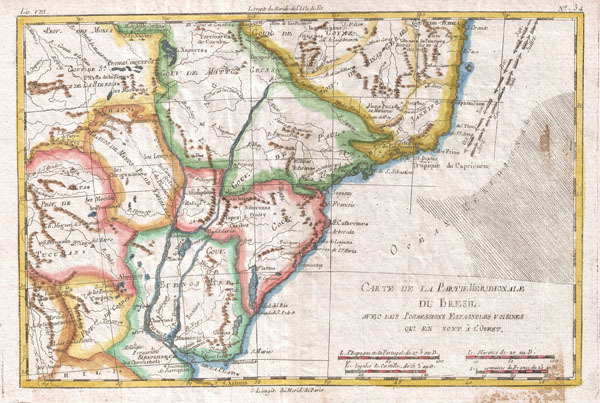 A fine example of Rigobert Bonne and G. Raynal's 1780 map of southern Brazil, Uruguay, and northern Argentina, including Rio de Janeiro, Montevideo, and Buenos Aires. This map generally corresponds to modern day Minas Gerais, Sao Paulo, Parana, Santa Catarina, Rio Grande du Sol, Uruguay, Buenos Aires, Motto Grosso and Paraguay. Offers surprising detail of the interior considering that this region was largely unexplored when this map was drawn. Of course, much of this speculative, including the Laguna de Xarayes, a mytical lake at the northern terminus of the Paraguay River that was associated with the Earthly Paradise by early explores. Xarayes, named after a local indigenous group, was most likely a misinterpretation of the Pantanal flood plain during the rainy season. Drawn by R. Bonne for G. Raynal's Atlas de Toutes les Parties Connues du Globe Terrestre, Dressé pour l'Histoire Philosophique et Politique des Établissemens et du Commerce des Européens dans les Deux Indes.